We explore some key car maintenance tips, and the available products from DENSO to help your car perform at its optimal best. Understanding the importance of regular maintenance, as well as using quality components, can help you to ensure that your car is in tip top condition. Additionally, servicing your car regularly (and properly) has a beneficial impact on your car's lifespan and performance. Here, with advice from DENSO, we look at three components that you should replace on a regular schedule. Have you replaced your spark plugs? Worn out spark plugs can damage your engine! The spark plug is a key component of the engine. It produces the sparks that ignites the fuel. The combustion of fuel produces power, which then allows your car to operate. Thus, the performance of an engine is very much directly related to the performance of the spark plugs. 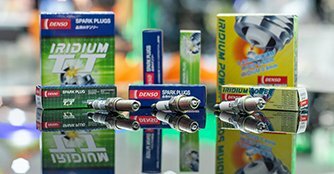 In the market, the commonly found spark plugs are the 'normal' nickel range plugs, as well as iridium range plugs. The latter is made of the rare iridium alloy, which greatly improves the plug's ignitability. The spark plug experiences extreme heat and stress in the combustion chamber, making wear and tear of the spark plug unavoidable. Therefore, it is necessary to have your spark plugs replaced at regular intervals. You might face poor fuel efficiency, decreased engine power and even a damaged engine when the sparking performance of the plug deteriorates. Of course, the different spark plugs have varying lifespans. 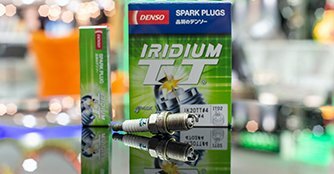 DENSO recommends that Nickel spark plugs should be replaced at 20,000km intervals, while Iridium spark plugs (TT or Tough series) usually can last for 100,000km. You should have them checked during your regular maintenance to ensure that they are still in good working condition. Also, be wary of counterfeit products on the market that might damage your vehicle. You are always better off buying through the authorised distributor. 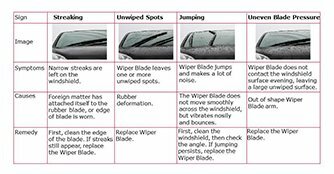 With Singapore's erratic weather, your car's wiper blades will certainly see regular use. 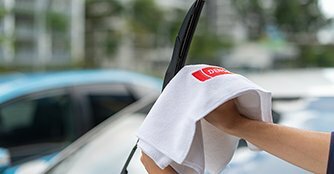 The wear and tear from the frequent usage, along with exposure to sunlight and heat in Singapore, will definitely affect the performance of your wiper blades. DENSO recommends users to change them yearly, which is usually when you start to see either scratch lines or unwiped spots on your windscreen. Additionally, when washing your car, it is also recommended that you clean the rubber on the wiper blade with a cloth gently, as dirt will often build up there. DENSO's wiper blades come with a graphite coating that helps to reduce frictional resistance. This ensures high wiping performance without chattering sounds and also does not damage the water repellent coating on the windshield glass, thus improving the durability of the wiper blade and your windshield. Just like your household vacuum or water purifiers, contaminants and unwanted particles will start to clog the filters overtime. Therefore, it is important to have these filters regularly replaced to maintain the functionality of the component. 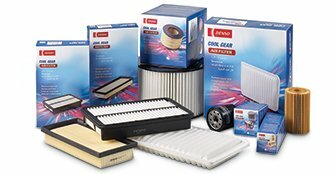 Below, we will touch on some filters in the vehicle that require regular replacement. An oil filter is designed to protect your engine from dangerous contaminants. Clean motor oil is important because if the oil was left unfiltered for a period of time, it would tend to become saturated with particles that can wear on the surfaces in the engine, which may lead to engine failure. Additionally, having unfiltered engine oil circulating in the engine causes combustion losses, which reduces engine performance and fuel efficiency. DENSO recommends oil filter change at every 10,000km interval, usually at the same time as when you do an oil change. However, do note that oil change intervals may vary depending on the car model, so you should check the owner manual for the recommended intervals. The air filter is an important part of the car's air intake system. It draws the air from outside into the air filter housing, where it is then mixed with the car fuel. Only then will the air be sent to the intake manifold that supplies the fuel/air mixture to the engine cylinders. The function of the air filter is to prevent dust and other foreign particles entering the air intake system. Any such contaminants will disrupt the exact mixture of air and fuel that the engine requires to run - this affects the engine performance and releases harmful emissions, leading to damage over time. 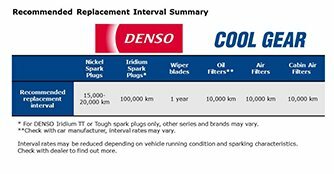 DENSO recommends that Air Filters should be replaced at every 10,000km interval. The third filter you will find in a car is the cabin air filter, otherwise known as the air-con filter. 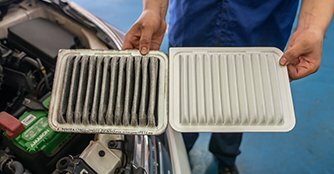 While it may not directly impact on your car's performance, a clogged cabin air filter may cause poor ventilation and prevent the air conditioner from working properly. This will impact on the quality of air within the vehicle, which of course can affect your health and well being. The cabin air filter helps to filter out mould, bacteria, dust and other kind of harmful contaminants from the air entering the cabin. 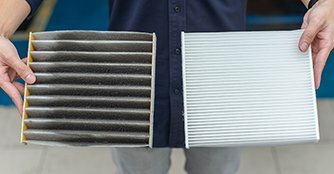 Similar to the Air Filter, DENSO recommends the Cabin Air Filters to be replaced at every 10,000km interval, or once a year, whichever is earlier. It is highly recommended to change your filters at the recommended intervals. Some may practise washing/cleaning the filters and reusing them, but this is not recommended, because there will inevitably still be particulates remaining on the filter, thus compromising its performance. DENSO is a leading supplier of advanced automotive technology, systems and components for all the world's major automakers. In fact, it is the OE manufacturer for most Japanese car brands. COOL GEAR, a product brand by DENSO, has been developed especially for the Asia Aftermarket. As leading supplier of advanced automotive technology, you can be assured of premium quality under its COOL GEAR brand. Ultimately, understanding the importance of quality products goes a long way to ensuring that your vehicle is performing at its optimal performance and condition. More than just offering you a peace of mind, using genuine parts goes a long way in helping to care for your vehicle, as well as taking care of key components like your engine. 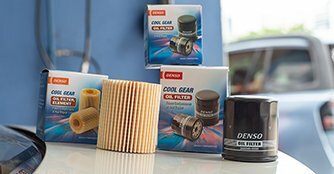 To find out more about DENSO and its full range of products, including its range of COOL GEAR products, you can visit its website here. For sales enquiries, you can contact DENSO's Authorised Parts and Service Dealer for maintenance parts, Satis International Pte Ltd.